The Turks and Caicos Preservation Foundation was founded in 2007 by Helen Krieble. 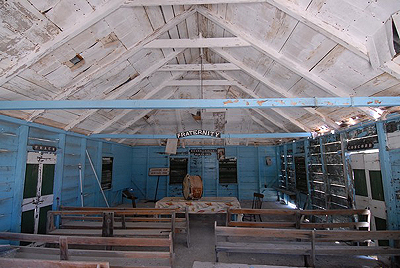 It was established as a U.S. public charity to help preserve and restore surviving historic sites and buildings in the Turks and Caicos Islands. Expenditures only include actual invoices for materials and labor for historic preservation projects approved by the Foundation, with no expenditures for foundation overhead or expenses. The expectation is that the foundation will work in partnership with The Turks and Caicos National Trust. Since inception the Foundation has focused on Salt Cay with its extraordinary potential to become an international tourist attraction. This small island, important for its production of salt from the 17th century to the 1960’s, retains much of its original historic character with salt pans, early 19th century salt proprietors houses, salt raker houses, churches, the Government House and the Benevolence Hall still in existence. Donations, large or small are welcome. To preserve this largely unspoiled heritage for the Turks and Caicos people and the world is an important and urgent effort. The Foundation Board welcomes participation and expertise from volunteers and relies on donations for financial support. All donations are tax deductible.